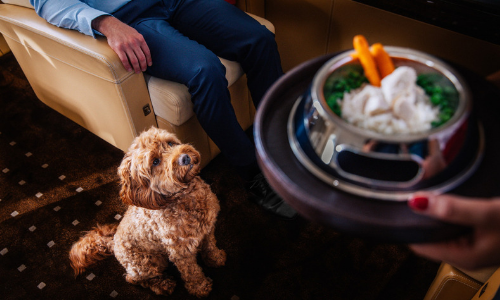 Global business aviation company Vistajet has launched a global pet travel programme to tap into the increasing demand by consumers to flying with their pets. According to the company, there was a 104% increase in the number of animals flown over the previous two years and travel standards have failed to reach expected service levels. Vistajet has found that 75% of pet owners do not trust commercial airlines to safely care for their pets, making the journey stressful for both animals and owners. The VistaPet programme has been designed in collaboration with experienced veterinary practitioners, groomers, dieticians, and coaches to respond to the needs and challenges during transit with animals. For example, VistaJet can arrange a fear of flying course for a customer’s dog, entailing four weeks of sessions to desensitise the pet to what they could experience during a flight, including the smell of fuel, the sound of jet engines, cabin air pressure, and the movements of air turbulence. Passengers will also be given a travel bag containing a collection of items to take care of pets during and after a flight. Bio-organic pet food from Rockster will provide pets with nutrients and a balanced menu will be offered to keep pets hydrated and healthy. After the flight, members can select a collection of pet-friendly facilities, including pet hotels and salons, along with partners around the globe. Pet walkers and trainers, or experts in pet yoga, rafting and surfing, will also be available upon request. Two provincial Chinese satellite TV stations have been suspended from airing all commercial advertising following the violation on..
Media Prima's spokesperson told A+M it will include in-game events in the future to optimise user engagement for Mak Cun's Adventu..